One of our AC / DC Transducers, the IRF-rms, is an instantaneous to true rms converter, matching the performance of high-end true rms voltmeters Its purpose is to convert ac, ac+dc signals to an isolated dc signal representing the rms. Its output signal can be scaled to meet most requirements, voltage or 4-20mA current loops, isolated or non isolated. 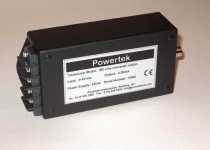 The IRF-rms is used typically in applications with voltage output current probes, current shunts and current transformers - providing an isolated signal that can be connected to a computer or data logger. The IRF-rms can be configured to operate with most current probes, current sensors and dataloggers. High voltage options up to 1000V are possible using model VTHR. One key feature of the IRF-rms is that it allows current probes and CTs to have both rms and instantaneous outputs, allowing the user diagnostic possibilities as well as metering.